Wow! What a Show! Our children were absolutely mesmerized by this fast paced and entertaining performance. 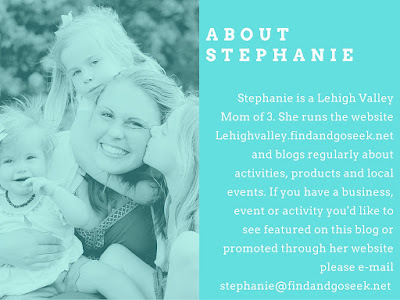 It was the perfect activity for a cold, rainy night here in the Lehigh Valley. The show opened with the classic Disney favorites, Mickey, Minnie, Donald and Goofy! They set the scene for a magical adventure through a number of magical doorways, each of which presented a different Disney character, their story and MAGIC! While singing the cast performed a number of magic tricks on stage that were seamlessly incorporated into the songs and storylines. Levitation, disappearing acts, sawing someone in half and more were a few of the tricks. The Buzz Lightyear Laser Show was pretty cool! Characters included the cast of Toy Story, Snow White, Cinderella, her fairy God Mother and her Prince, Aladdin and the Genie and Rapunzel with Flynn. The show touched on a number of different stories and incinerated a great variety of characters. I was thrilled to see Rapunzel who happens to be mine and my kids favorite princess. The above video is the final performance of the show. Shows continue tonight at the PPL Center at 4pm and 7pm and on Sunday at Santander Arena at 1pm and 4pm. Tickets are still available and more information about purchasing them can be found here. We had an excellent time and hope to see another performance again soon. The PPL center is a phenomenal family venue, the enclosed parking deck makes for absolutely seamless entry and exit (especially on a super rainy and cold night). With the venue being divided into about 1/3 of its size for the show, every seat provided a great view! 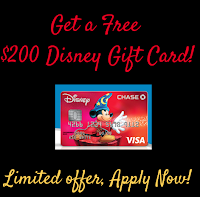 Interested in traveling to Disney World?! 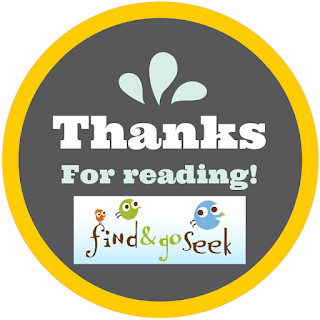 Check out two special offers exclusively for our readers! Just click the images above to learn more! 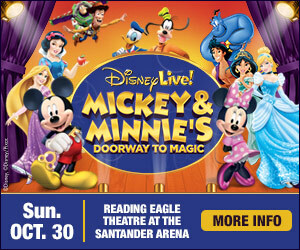 Disney Live Comes to Allentown and Reading! Disney Live is coming to Reading and Allentown in October 2016 and Lehigh Valley Find and Go Seek has tickets for you to WIN! Check our Facebook Page for daily posts with opportunities to win tickets to Allentown's performance on Thursday October 27th at 6pm or for Reading's October 30th Performance at 4pm. 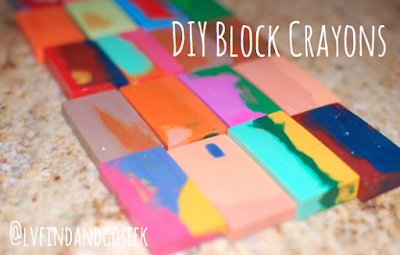 Our kids are SO excited for this! 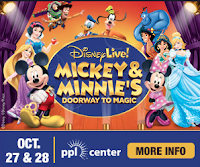 They absolutely loved their Disney On Ice experience in 2015 and are really looking forward to this amazing show at the PPL center. The PPL Center is such an amazing venue to see shows like this because there is seriously no bad seat in the place. They confine seating to about 1/3 of the normal size of the center making for an intimate setting, every child can see all of the action in all of its Disney glory. 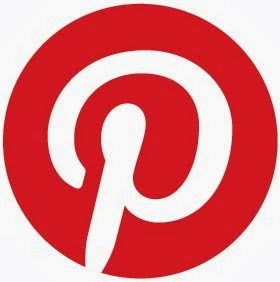 View the show in action! Open the door to reveal mesmerizing worlds of unforgettable Disney moments and grand illusions with Disney Live! Mickey and Minnie’s Doorway to Magic. Join Mickey Mouse, Minnie Mouse and the comical duo of Donald and Goofy as 25 of your favorite Disney characters surprise and captivate at every turn of the knob! See the Fairy Godmother transform Cinderella’s rags into a beautiful ball gown in a split second; the Toy Story gang defy the dimensions of Andy’s toy box with the help of the green army men; and the spectacular stage debut of Rapunzel and Flynn Rider as they rise into the sky amidst the floating lanterns. With special appearances by Snow White, Tinker Bell and Aladdin’s Genie, you never know what to expect or who might join in the fun. In Disney Live! Mickey and Minnie’s Doorway to Magic you hold the ultimate key to unlocking your imagination. 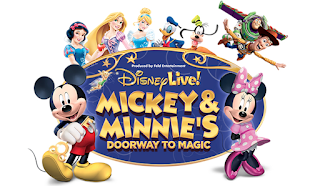 Read our review from Disney Live at the the PPL Center! 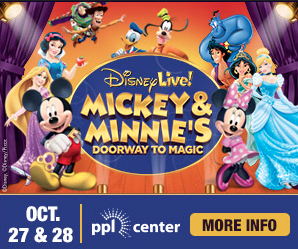 Disney magic is coming to Allentown! 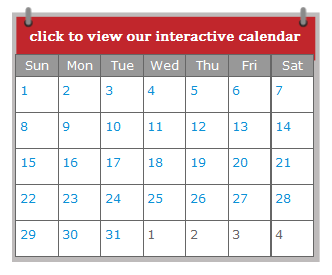 Thinking of traveling to see Mickey in Orlando soon? 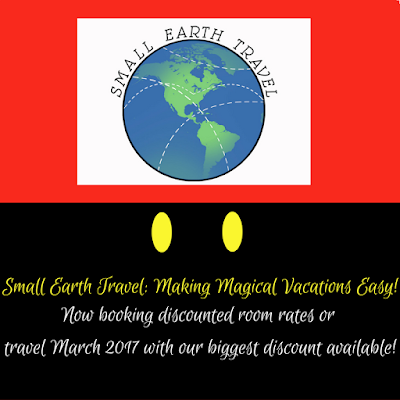 Small Earth Travel: Making Magical Vacations Easy! Just Between Friends - Fall 2016 Sale Preview! I visited this morning for some great finds! Our list was pretty small this year as I collected much of what we needed for the fall throughout the Spring and Summer, that being said I still took home two giant bags of clothing outerwear and a few items for Christmas! Check out my Live Videos from the sale this morning (below)! The first one got cut off, just click over to the second for the continuation (be patient or feel free to skip the first 2 minutes, it took a minute to get the feed up)! Check out this awesome Panorama showing the whole sales floor! There is so much awesome stuff out! Even if you don't need clothing - you literally could do ALL of your Christmas/Holiday Shopping at once! 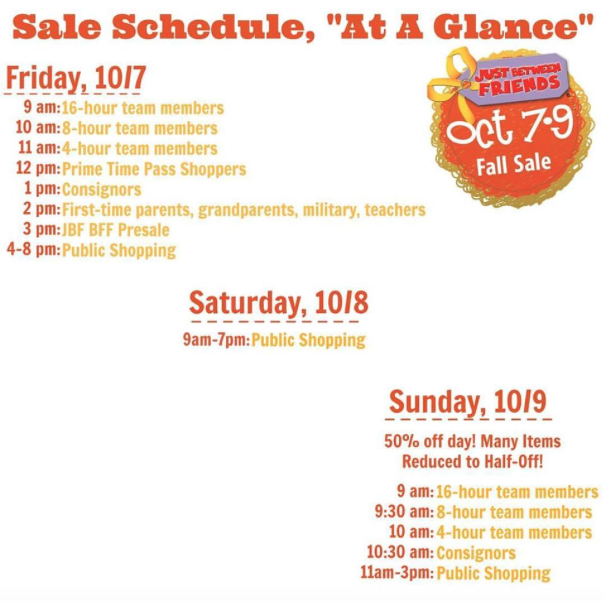 I'm not one to shop 1/2 off sales - usually because I spend too much during the Pre-sale BUT there was SO much at this sale I think I may actually go back Sunday morning and check for some stuff we can stash away for future seasons. 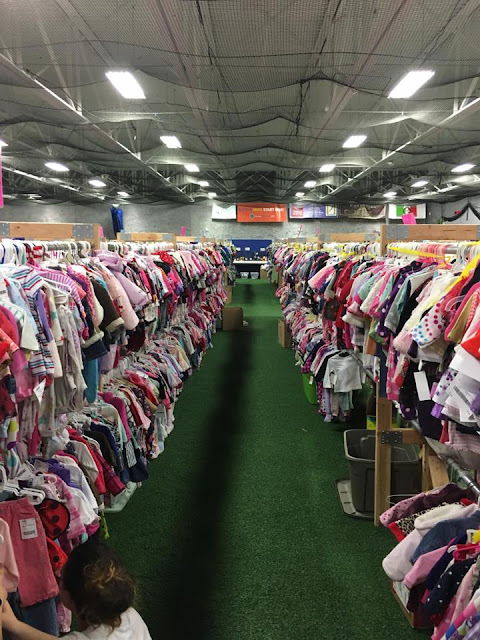 Some of the infant Girls' items! 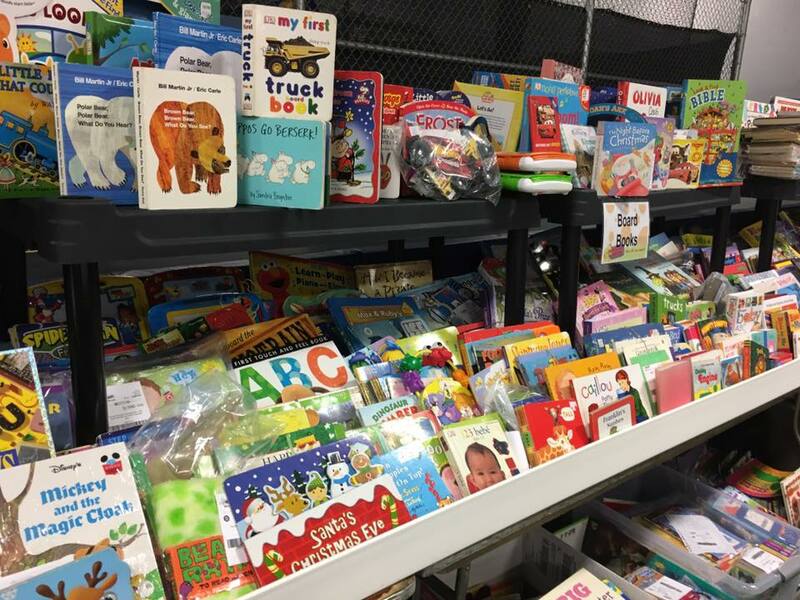 Loads and Loads of BOOKS! I dropped a bunch of our baby books for sale this weekend and purchased some older kids books this morning to start to change out collection since the kids are getting bigger (wash!) - See my unbagging video for what I found! New this sale!!! 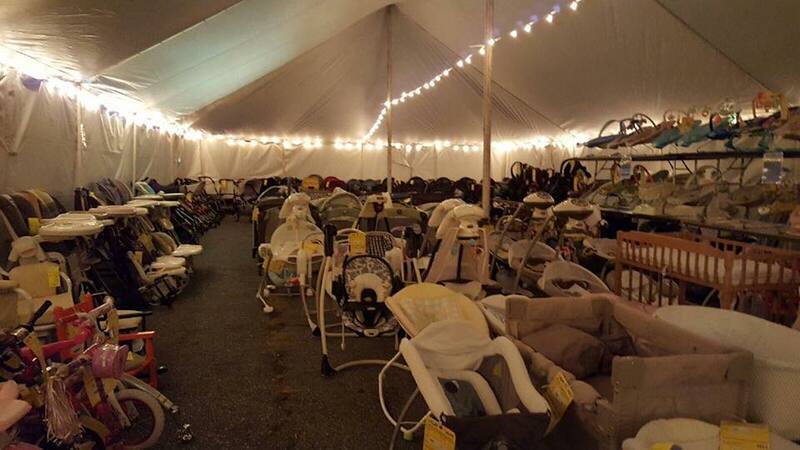 JBF has expanded their sales floor by adding a HUGE outdoor tent for large scare items - strollers, cribs, pack n plays, bouncers, bikes, slides and MUCH more. Do not miss this! The door to enter the tent is at the back right of the indoor sales room. 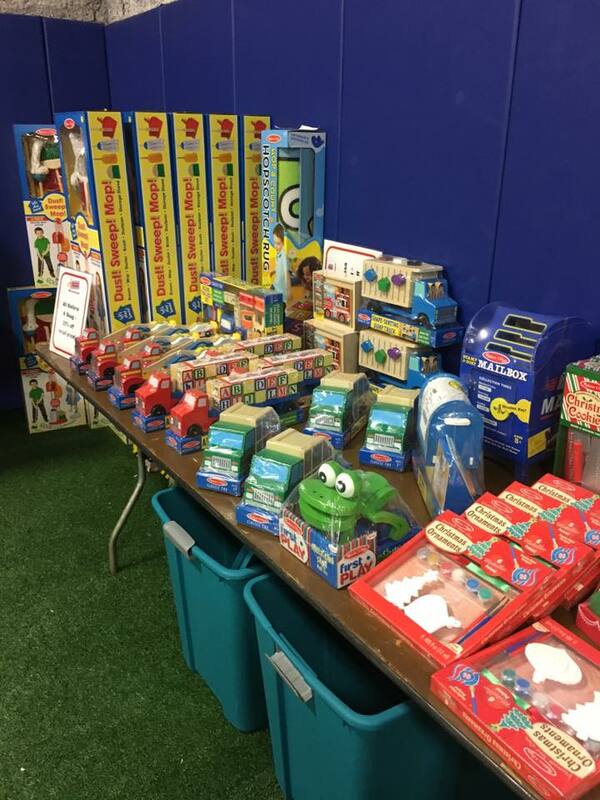 JBF stocks NEW unopened Melissa and Doug Toys and best of all they're all marked 25% off retail! 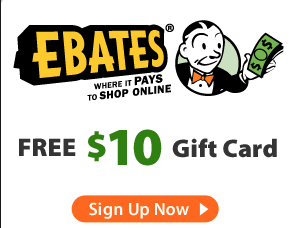 These are awesome for doing some early Holiday shopping! 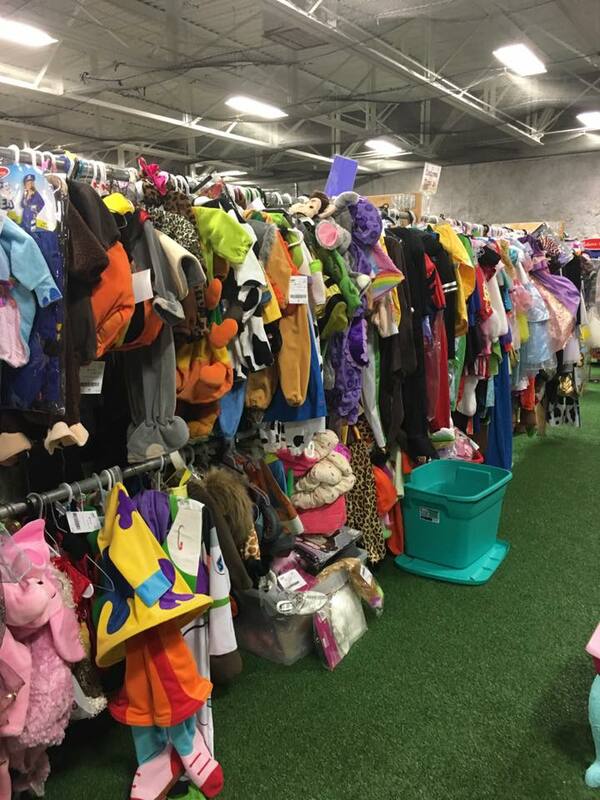 Costumes Galore!! So many they don't even all fit in the photo! 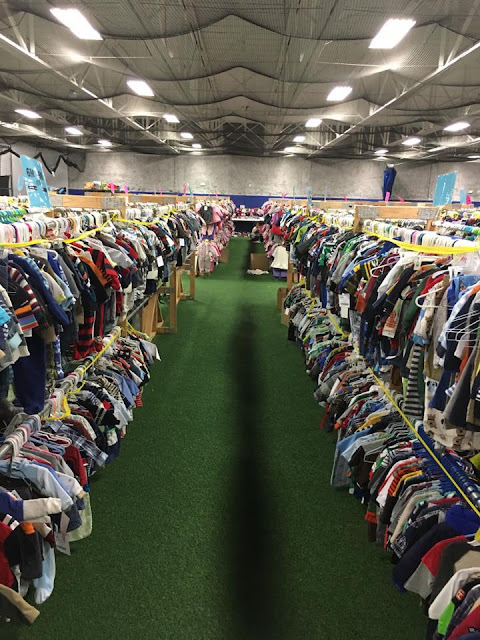 Check our my Haul!!! So much awesome Stuff! To Enter to win Disney LIVE! tickets watch our "unbagging" video above and make a guess as too how much I spent! Every one who comments gets an entry and the person who is the closest gets 10 entries!